I was almost hijacking the Monster thread and Kareloh was polite enough to suggest me opening this new thread. 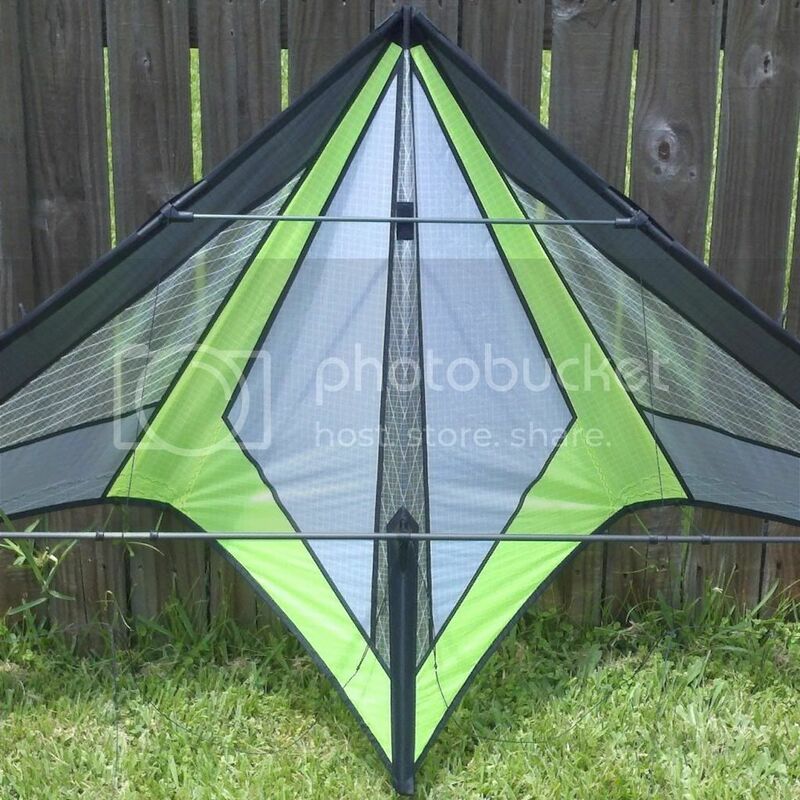 Well as I was saying in the other thread, I really find the Le Quartz a difficult kite to fly. I should have the bridle correctly set up as the plans mark. My build was quite clean and I cannot see any faults in the sail or any other part. I have tried different tail weights: 0gr, 5gr, 10gr and 15gr. I'm really sad because I put a lot of effort and motivation in the construction and I am extremely happy at the layout I chose and at the level of detail of my construction. But the kite seems to be "stubborn". I cannot make it do the same things I can do with the FW Soul and the Talon UL. Any comments on this will be greatly appreciated. 1 Set the kite on your normal lineset in NO wind. 2 Launch the kite vigorously. 3 The kite should go up about 20 feet. I prefer my kites to go up about 30 feet in this test. This means my kites tend to fly in lighter wind, but trick less well. Hope you find your problem. How is it that I never thought of this excuse ... er ... line of reasoning? So if the kite does not go up, what are the steps then? Steve, you don't need any excuses. Ara, the less the kite goes up, the "heavier" it is set up. is easier to stall to start a trick and to pitch more quickly. the upper bridle legs about 1". It's a quick and dirty test. knots to shorten the leg. Although I did use the default bridle adjustments listed on Tom's site I did need to make a few more adjustments. I installed additional knotted adjustment connectors at every LE connector to allow me to "experiment" with different turbo bridle setups. Especially since it was being assembled with low quality RSN and Nitro tubes I had no idea how it would behave compared to a project recommended Icarex sail and 6mm hi-modul pultruded tubes. Simply, I use the standard bridle setup now that Hugo listed except I often will add 1.5 cm on the Uphaul on moderate winds 8-12 which gives me a good freestyle accessible kite. As Chilese describes as a heavy kite setup. The Quartz seems to have always been described as a beginners kite that gives you access to most tricks available although none looking exceptional. For me it lets the Quartz fall into deep backflips, susans and such rotate fairly flat, fades are easy enough to manage (again my current sail material is fair compared to Icarex) and yoyo based tricks don't seem to require anything more than moderate inputs. Although I seem to need to provide inputs at a slightly faster rate. Axles still come off a bit sloppy but I think its because I need more wingtip weight so I may change my P2X LLE to P3X or P300. Currently using 100/100 Skybond line. I am by no means an expert in anything Freestyle but this kite, even with low grade materials, is still a fun, trickable kite that will soon get a replacement sail in Icarex once I locate some Mylar. If you need any bridle options I found in different forum posts I would be glad to post later tonight or PM them to you. We did find out that the cheapest frame (pultruded/higher flexing frame) is put under a lot of pressure by the bridle as it is made now. Upper leg: 22.44 inches (57 cm), meassures are taken on the kite from the knot on the top to the point where the inner leg is connecting. P200 ULE and P300 LLE, P100 top cross and P300 spine. 47cm upper, 43cm lower, 63cm inner, and 9cm turbo. It tracks a little better and turns a lot sharper. The thing is that I used 6mm carbon tube for the LE in a single piece instead of using two pieces of conical tube. From Hugo's description I might be getting too much flexion... Could that be? Then changing the bridle might be the solution. What I have experienced up until now is that the kite in low wind tends to bounce forward and backward when flying slowly up.Also it tends to oversteer and in axels it does them too fast and sloppy. So I will try Chilese's suggestion and observe what happens. I will also try the different bridle adjustments you published. I really hope I get a good flying kite and recover my motivation on it! with stressing the frame of the kite. pecking should go away and the frame would be less stressed. It sounds like we are indeed getting somewhere. I have now many tests to do. I'll report back when I have time to do them. I have normal pultruded rods as LE in my Quartz as well, and like it a lot. Tried p200 and didn't like it AT ALL! I guess there something not quite right with your bridle settings. It should have larger then normal turning radius with the original bridle setting though. I believe i've shortened the outhauls by 1 cm and tend to have it set quite heavily. Still it performs very well even in low winds. My Le Quartz has rollbars and 20 grams in the tail. Wow! If I get my L'Quartz to fly like that I'll be one extremely happy man! 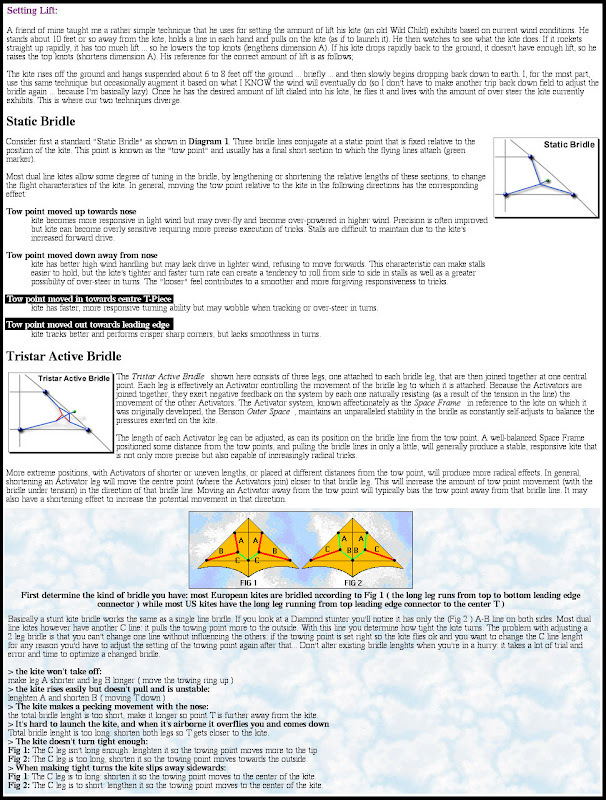 OK, this weekend I'll check all bridle configurations and will do all the tests and hopefully I'll win a new kite! I also just wanted to make sure that you did reference the frame diagram to ensure that every and all points do meet specifications. I'm sure you did when building but just making sure. I know I had originally improperly set the US approximately 25mm too low and the LS 40mm too low since I had not seen this image until after the assembly of my kite. Compared to the specifications listed it was very off and the kite behaved quite poorly. In low winds it bounced and pecked somewhat as the upper portion of the sail was not properly tensioned by the US and the pitch rotations were off and quite slow as the bottom end LS were not properly balancing the kite. Once set to the correct frame specifications everything worked wonderfully. Again this kite has uncoated, higher stretch RSN and yet still flies quite well. I'll also check these measures, although I followed the original plans. I forgot to post the Parody VF that I helped my son make at home on his computer afterwards. This is the original footage captured from where I got the snapshot of the moon. He's only 13 and wanted the Yo-Yo he did to be posted. Figured Ara and Kareloh get a good laugh to get the spirits up. Between all the posted information online and all the great support on this forum you will get your Quartz flying very nicely again!